When people think of web accessibility, they usually think of making websites for blind individuals using screen readers. However, it isn’t just blindness which needs to be considered when making websites accessible! Many people suffer from other visual impairments. If your website isn't made with these users in mind, then they may not be able to access your website. 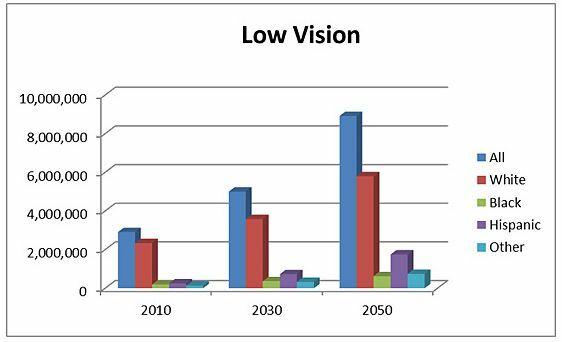 According to the most recent statistics available at the National Eye Institute (NEI), there are already over 2 million people in the United States alone who suffer from low vision. As the population ages, this number is projected to skyrocket over the coming decades. In addition to low vision, there are also numerous other sight impairments which could make it difficult for people to see websites. Some of the most common ones include color blindness, glaucoma, Age-Related Macular Degeneration, cataracts, and diabetic retinopathy. People with low vision often use screen magnification tools to use the internet. Unfortunately, a lot of websites don’t work very well with screen magnifiers. For example, when the text is resized, it may break the layout of the site so the user has to scroll to track text. Sometimes navigation doesn’t work at all with screen magnifiers when the site isn’t designed for accessibility. Under WCAG 2.1 AA guidelines, websites should be able to resize up to 200% without losing any functionality. Many visual conditions (including cataracts, glaucoma, and retinitis pigmentosa) make it difficult to view contrast. Unfortunately, many web designers fail to take this into consideration when coming out with the color scheme for a website. For example, it is common to find website designs which use very slight gradients in color to distinguish features or elements. Users with normal vision may find the design pleasing. For users with difficulty seeing contrast though, the color choice can make the website very confusing or impossible to read. It is still possible to make a beautifully-designed website that is also accessible to individuals with contrast impairments, though! Designers just need to consider the level of contrast when choosing color schemes. Under the WCAG 2.1 AA guidelines, text and images of text should have a contrast ratio of at least 4.5:1. Color blindness is another common visual impairment and designers need to be aware that many people won’t be able to see certain colors (green and red being the colors which cause the most problems). It is especially important to keep accessibility in mind when designing buttons and forms. For example, it would be poor design choice to use a red button for "Cancel" and a green button for "Sign Up." The color choice could create confusion for the many people with color blindness. Is your website accessible to people with visual impairments? If you aren't sure, Monsido can help! See Monsido's web accessiblity features here.